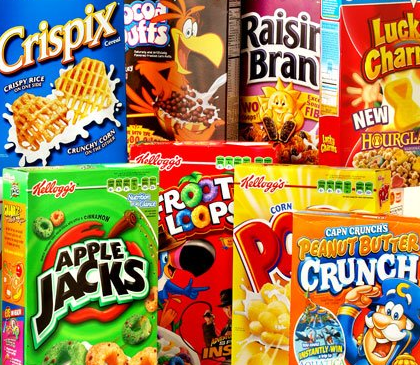 Parents have been starting their children's day with breakfast cereal for years, but they may not be aware of what's in them. The problem with many breakfast cereals is that they are loaded with sugar. According to a study done by The Environmental Working Group, an environmental health research and advocacy organization, here are top 10 breakfast cereals with the most sugar content. Fruit Loops (Kellogg) - 41.4 percent sugar. Even though the box says "good source of fiber and whole grain," that's not enough to make up for the high sugar content. Smorz (Kellogg) - contains 43.3 percent sugar. Again, the box adds that the cereal is a good source of vitamin D, but this is not making up for the sugar content. Oh!s (Quaker Oats) - has 44.4 percent sugar. Cap'n Crunch Original (Quaker Oats) - has 44.4 percent sugar content. Cap'n Crunch OOPS! All Berries (Quaker Oats) - comes in at 46.9 percent sugar. Fruit Loops Marshmallow (Kellogg) - rates 48.3 percent on the sugar meter. Golden Crisp (Post) - comes in at a whopping 51.9 percent sugar content. Honey Smacks (Kellogg) - tops the list with 55.6 percent sugar. What does sugar do to your children? Too much sugar is bad for anyone, including your children. Allowing them to consume too much sugar can lead to tooth decay, damage to the liver, increases glucose in the blood which can lead to obesity, cardiovascular disease and type II diabetes, and cause people to be addicted to junk food. The bottom line is, sugar can be harmful to your children!